The main plugin feature is the review box, a component you can insert in posts, pages or custom post types that defines an author review and user reviews. There are three types of review box; the definitions are included in the Glossary article. There are two ways of creating a review box: manually or automatically. Let's explain in details how to create both ways. Assuming you configured the settings in the Reviewer > Preferences page and created at least one Reviewer template, you can follow the next steps. When you create the Reviewer template make sure to skip the Automatic Box. Do not select any post types. Open the editor of a post or a page. You will find a new section for creating review boxes. By default the section is available on standard WordPress post and pages; if you want to add review boxes on custom post types you have to enable the post type in the Preferences page. Choose the type of review box you want and press the Add new review box button. The review box settings will be added to the page so you can tweak and fill all available options. After the configuration, you will find at the bottom of the section a list of WordPress shortcodes that will display the full review box or some of its parts. Just for testing, copy and paste the first one [rwp_box id="0"] inside the content. Save or update post/page and view the changes. You can add, edit or delete any review box you want. In theory, you can create an unlimited number of review boxes per page, but it is not a good practice to create a high number of review box on a single page because it could increase the page loading. If you have a huge number of pages and you have to add a review box on each one, creating a review box for each page it will impossible. 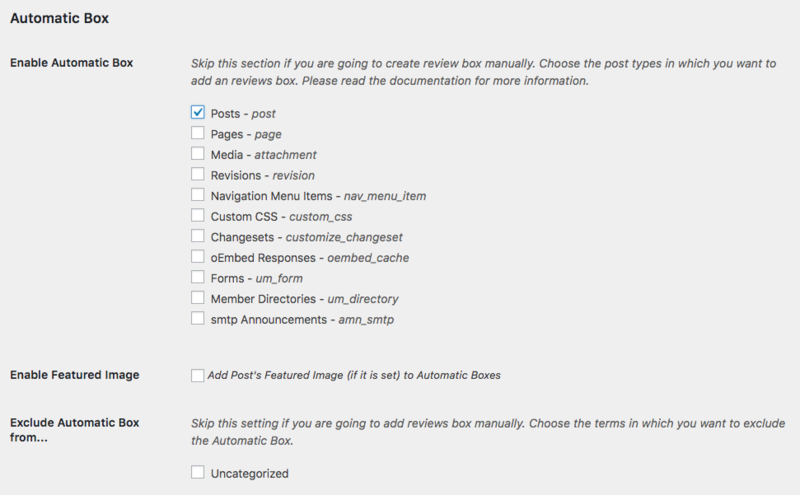 Luckily, the Reviewer plugin has a feature called Automatic Box that will add a review box on each page automatically. Enable Automatic Box feature in the related section of Reviewer Template. Choose the post type in which you want to add a review box. You can exclude some categories so the review box will not be added. Let's imagine for example that you want to a review box on each regular WordPress post. In the template check the Post type and you are good to go! Make sure to save the template.